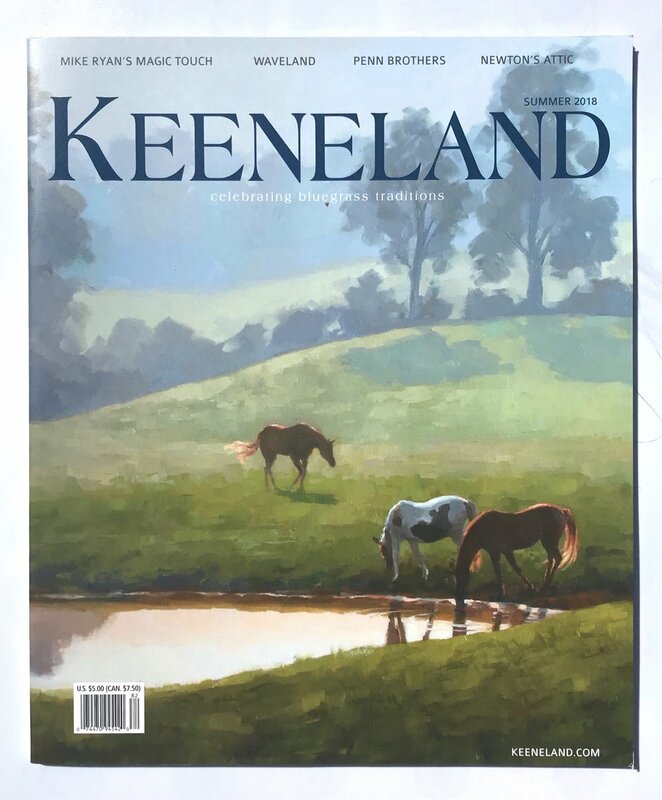 Early in the spring, Keeneland editor Jackie Duke reached out to ask if I'd be willing to have my painting Early Morning in the Bluegrass featured on the magazine's cover. It was an easy answer! I was honored to have my work on the cover of a magazine that's featured Quang Ho, one of my favorite contemporary painters, plus highly regarded Kentucky artists like Andre Pater and Kelly Brewer. It's a special joy to have my painting on Keeneland magazine given that I have memories from the trackside there that stretch back into early childhood. I grew up in Lexington, and my parents made a regular habit of taking my sisters and me to watch thoroughbreds warm up on the track in the cool mornings during the spring and fall meets. I do the same with my three-year-old son now--it makes a big impression on him to watch the power and grace of these athletes.